A companion for your literacy and learning journey. Do you believe that communication growth, engagement, and literacy is possible for your child? We do. 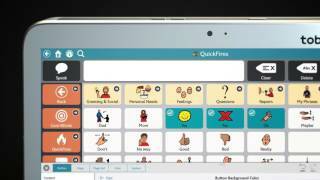 Snap™ + Core First® is a symbol-based communication app designed to be the most intuitive solution on the market. It lets users start communicating quickly and stay engaged as they grow and evolve on their communication journey. Centered on Core First, a systematic, proven, research-based Core Word framework, this app provides the fastest and most efficient communication platform for students, parents, and teachers alike. Want to try before you buy? Download a free trial version of Snap + Core First for iPad. For a complete list of Content updates, please click here. For a complete list of Software updates, please click here. The number of rows displayed in the Toolbar separate from the Page grid size can be set. To help improve Snap, customers may opt-in to send anonymous Snap usage data to Tobii Dynavox. New Page Set Guides available in Systems > Help and Tutorials. Data Collection - Track progress and communicate development over time with the new data collection feature. When the in-app track button usage is enabled, Snap will record information about each button activation. Basic button usage data can be visualized as button usage counts within Snap and additional data visualizations are available in the Usage Reports section of your myTobiiDynavox.com account. Modeling mode records data events separately so that they can be differentiated from normal user events. Backup/Restore to myTobiiDynavox.com - You can now backup/restore your pages to myTobiiDynavox.com directly within the software. IR Support for I-Series+ - If you’re using Snap on an I-Series device, it now supports IR functionality. Shutdown/Restart actions (Windows only) – These actions can now all be done within the Snap software. New Colors – Customize Snap with new color options. Colors include: Pale Pink, Lilac, Pale Blue, Pale Cyan, Silver Green, and Cream. For a complete list of Snap + Core First updates and bug fixes, please click here. NEW languages: Snap + Core First is now available in Spanish, Swedish and Dutch (Lite). The Dutch (Lite) version does not include software support for Inflector Buttons (word forms), automatic inflection of Grammar Buttons, automatic formation of contractions and compound words, and symbol search using morphological variants of words. Snap is also available in English (US, UK), Bilingual English/Spanish, and German. Link Visualization (pageset style setting) - includes options to display all “link buttons” with Navigation Icons (the default), in a folder shape, or with no distinguishing style. Clear after Speech (user preference) - automatically clears the Message Window when text is inserted after the Message Window has been spoken. For a complete list of new Snap + Core First updates, please click here. Snap + Core First Subscription Now Available - Need a short-term communication solution or do you want to just pay as you go? Snap + Core First is now available as a monthly subscription for just USD$9.99 (also available for USD$119.99/year). This option is perfect for those who want to pay only as long as they need Snap + Core First, for example users with a short-term medical need, like intubation, stroke or other brain injury, and other conditions. It is also ideal for users wishing to trial the software beyond the available 30-day free trial. In addition, the Snap subscription is a great way to access the leading software on the market without having to pay all at once. Subscription options are available for the iPad and Windows-based devices. To purchase the subscription option, please click here. Additionally, joining the Spanish/English bilingual pageset, Snap + Core First extends the well-received software to support the German language. This German release introduces the German core words, is localized for topics, supports German word prediction and morphology, symbol search, and more. The German Snap + Core First page set also integrates the German LiterAACy supports from Tobii Dynavox’s Sono suite. For a complete list of Snap + Core First 1.3 release notes, please click here. Syncing - You are now able to sync Snap + Core First between two different devices. This is especially important for modeling and being able to make a change without taking the device away from the user. 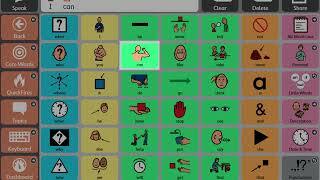 Companion App – Those using Snap + Core First on a Tobii Dynavox device now have access to a free companion app version of the software for use on a different device. Tobii Dynavox for Professionals – ASHA- and SAC-certified SLPs, SLPs from outside the U.S. and Canada, and other professionals in the field can now get Snap + Core First for no charge through the Tobii Dynavox for Professionals program. App Switcher – We’ve made it easy to seamlessly switch between Snap + Core First and Communicator 5. To do so, you can program a button in Snap to launch Communicator and vice versa. For a full list of Snap + Core First 1.1 release features, please click here. Who would benefit from a Snap + Core First Subscription? This option is perfect for those who want to pay only as long as they need Snap + Core First, for example those with a short-term medical need, like intubation, stroke or other brain injury, and other acute conditions. It is also ideal for those wishing to trial Snap + Core First beyond the available 30-day free trial. In addition, the Snap subscription is a great way to access the leading software on the market without having to pay all at once. What is the difference between the perpetual app and the app purchased on either the iTunes or Windows store? The functionality is exactly the same. The difference is that you’re able to purchase the perpetual app with a purchase order. However, the perpetual app is for Windows only. Once the amount I pay for the subscription reaches the full one-time purchase price of the app, do I own the app? No, you would either have to continue paying the subscription price or complete the one-time purchase. What happens if I miss a monthly payment on the subscription? If you miss a payment, you will be reminded by email and asked to update your credit card details. In case of non-payment, your subscription will be cancelled and you will be notified that your subscription has expired. If I start out with a subscription and decide to move to a one-time purchase, do I get credited the money I paid toward the subscription? No, your credit card information is not stored. Currently, the customer enters the card, the number is passed directly to the gateway (Mastercard/Visa/American Express), and we receive a token which is used to charge it going forward. This is all in compliance with https://www.pcicomplianceguide.org/faq/. Does my subscription automatically renew every month/year? Yes, your subscription will continue to renew every month/year until you formally cancel. When a subscription is cancelled, the end date of the subscription is set to the last date in the current period in which you are enrolled. If you wish to end your subscription, you can use the cancellation link provided upon initial subscription activation, or contact Tobii Dynavox Support. A cancelled subscription does not immediately become deactivated. Instead, the canceled subscription remains active until the end of the subscription period for which you have paid. What happens to my pagesets if I cancel the subscription? You will continue to have access to your page sets and to myTobiiDynavox.com when you end the subscription. The Snap + Core First software will stop speaking and digital assets that are included with the subscription will become disabled (e.g. 3rd party, but not PCS, symbol sets). But the restoration of your subscription will also restore those features.